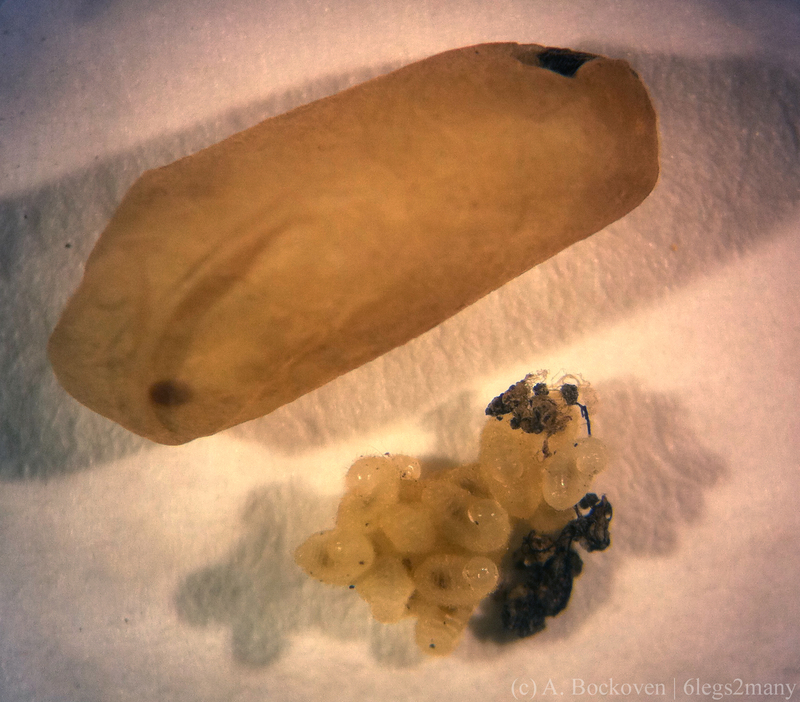 Carpenter ant pupa cocoon and first instar larvae. Ants, like butterflies, are holometabolous and go through complete metamorphosis with an egg, a larva (~caterpillar), a pupa (~chrysalis/cocoon), and adult ant (~butterfly). In ants, the larvae resemble small white grubs and cannot move by themselves–they are fed and tended by the worker ants. 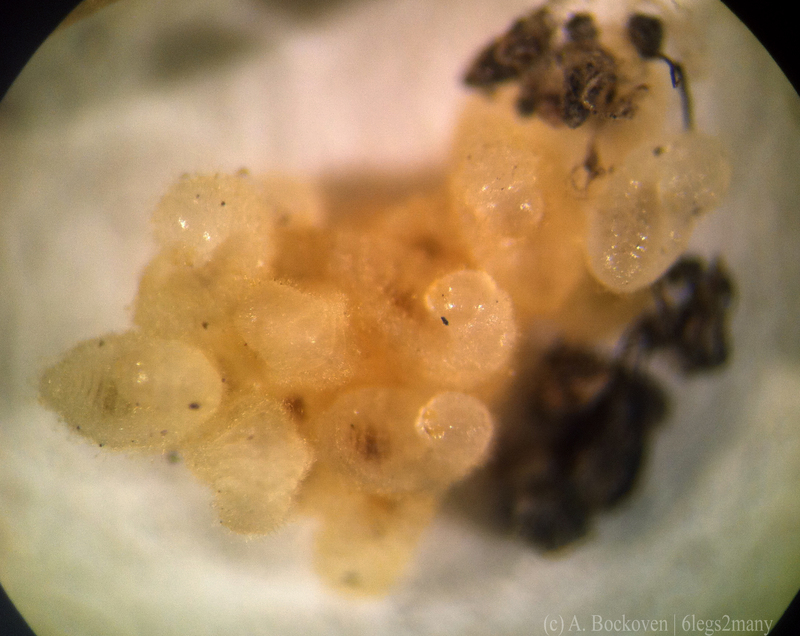 Carpenter ant first instar larvae viewed under magnification. 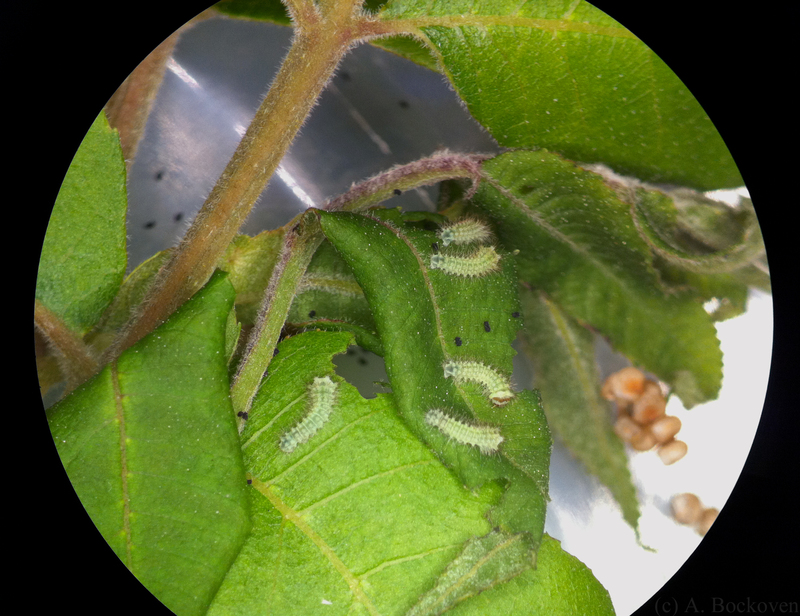 The larvae are covered in fine hairs which help them stick together in clumps, making it easier for adult workers to move and tend them. In fire ants, these hairs also help with rafting behavior, because they can trap a layer of oxygen around the larvae, helping them breathe and making them extra buoyant. Rafting fire ant colonies use their babies as tiny floatation devices. Please take a moment to consider the wonder of nature. 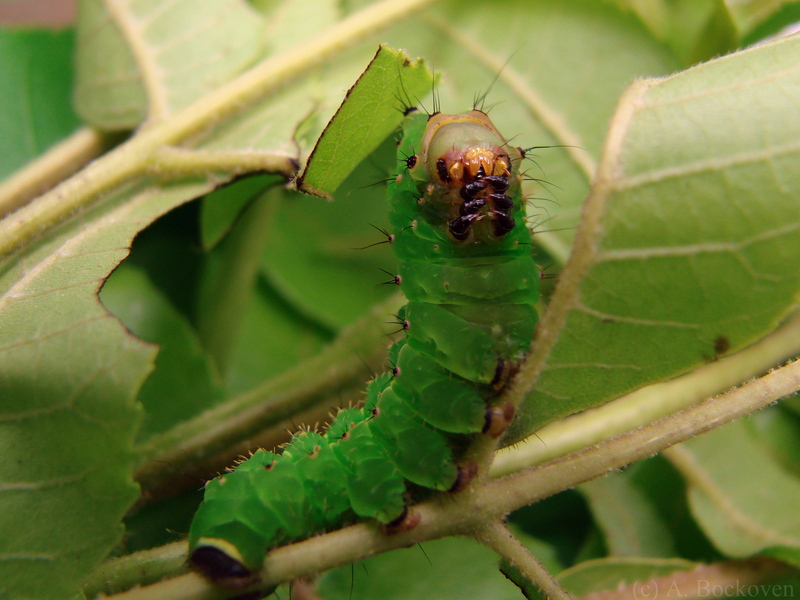 As they grow, the larvae molt several times, and each growth stage is referred to as an instar. 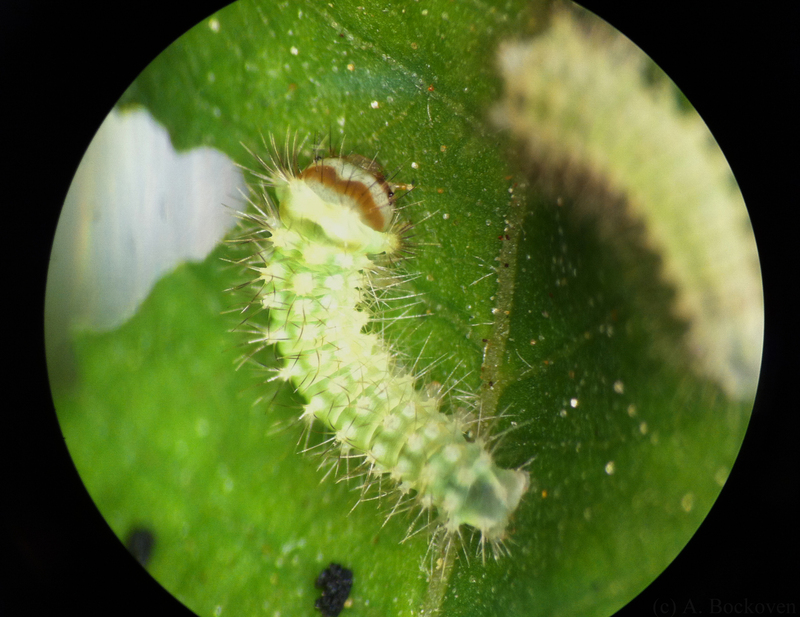 The larvae pictured above are extremely tiny because they are first instar larvae, having only recently hatched. 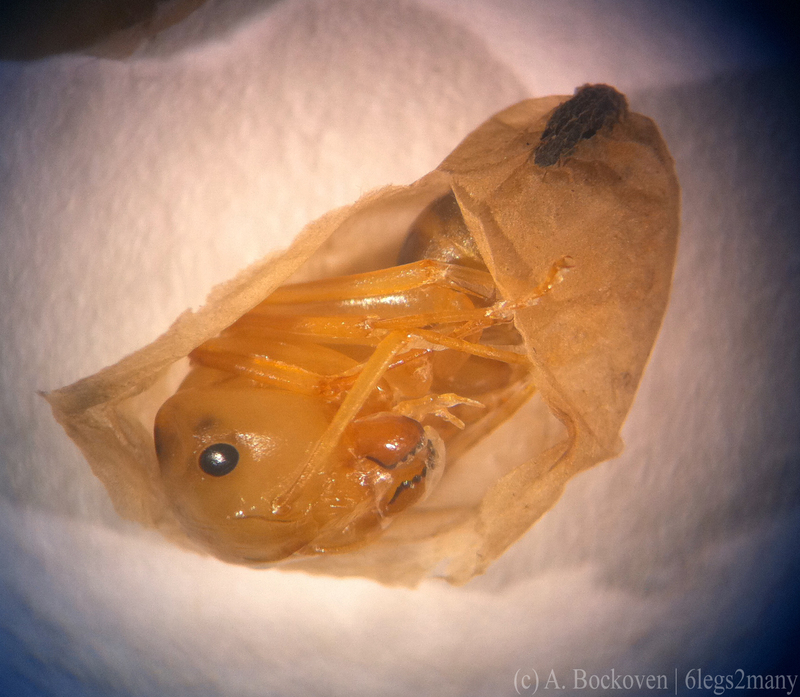 A pupating carpenter ant larva after spinning her cocoon. 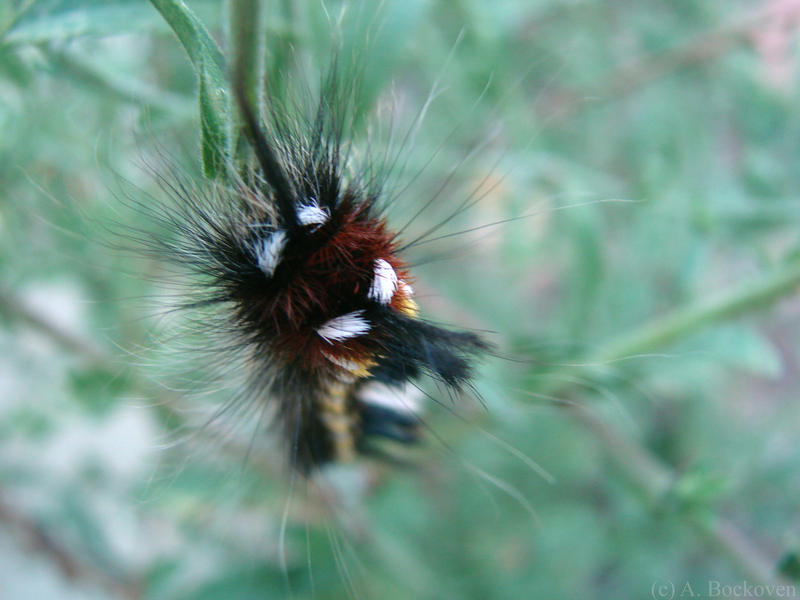 When the larvae are old enough they prepare to metamorphose into adults. Some ants, like these carpenter ants, spin themselves into cocoons to pupate, while others, like fire ants, leave their pupae exposed. 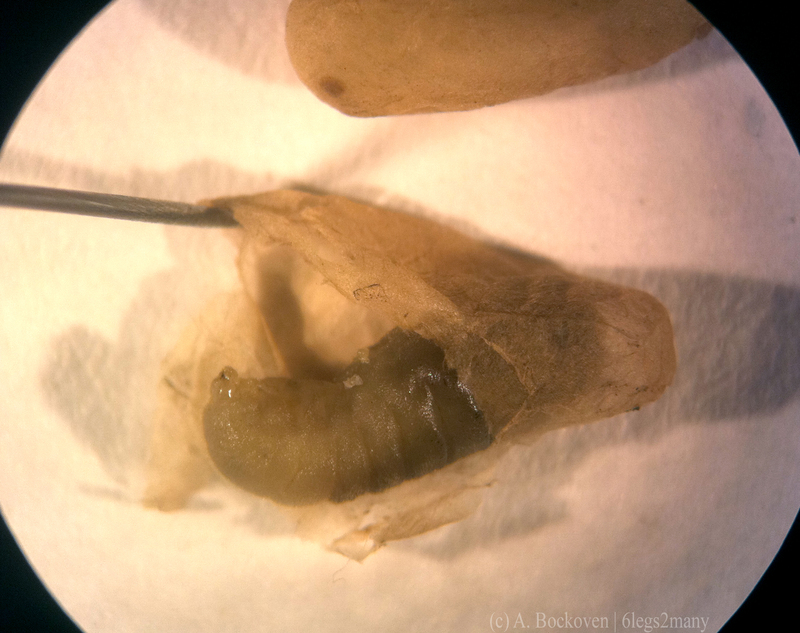 Above, you can see an opened cocoon that contains a larvae that has not yet molted into its pupal form. Additional fun fact: ant larvae have a closed digestive tract (I assume to prevent them from making a mess all over the colony. It’s like the ant equivalent of diapers.). 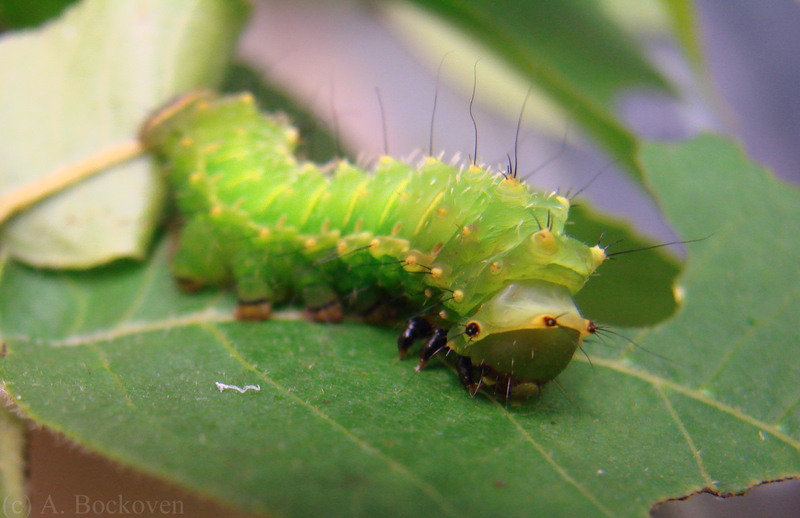 They poop for the first time when they molt into pupae. 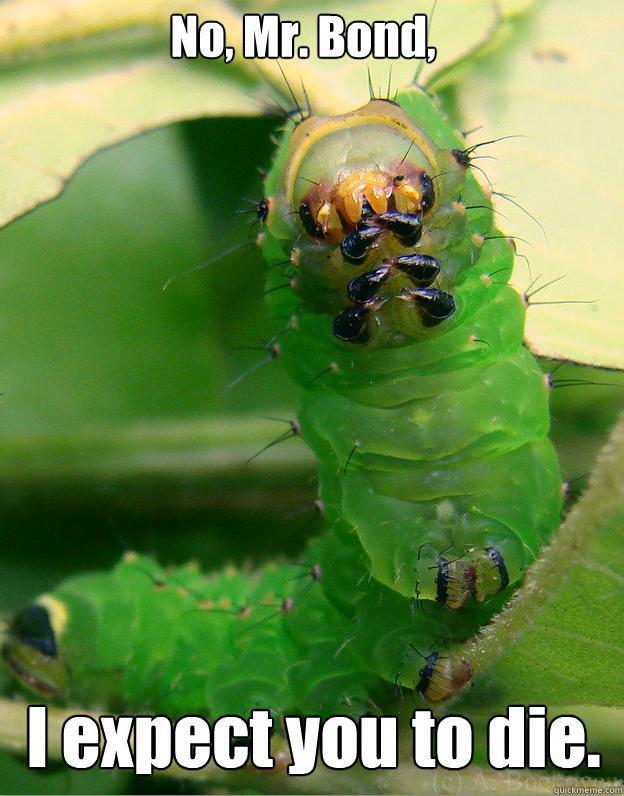 Best line from a paper ever: “…the larva defecates for the first time…. Workers help out.” (Taber, 2000). This is also the least appealing job description. A carpenter ant pupa in her opened cocoon. While the job of the larva is eating and growing, the job of the pupa is developing–reorganizing its system into an adult ant. Ant pupa look basically like unmoving, pale adult ants, darkening up right before their final molt to adulthood. 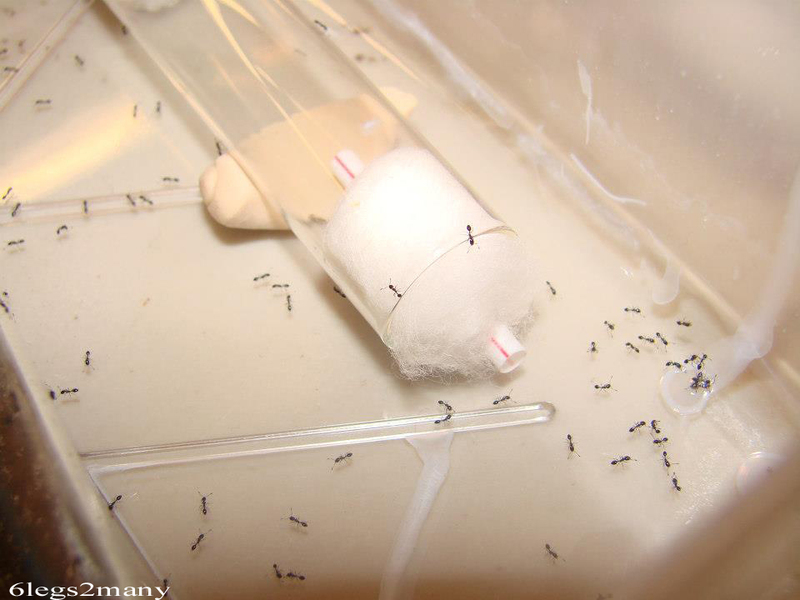 The newly molted ants are still fairly pale and soft-bodied. 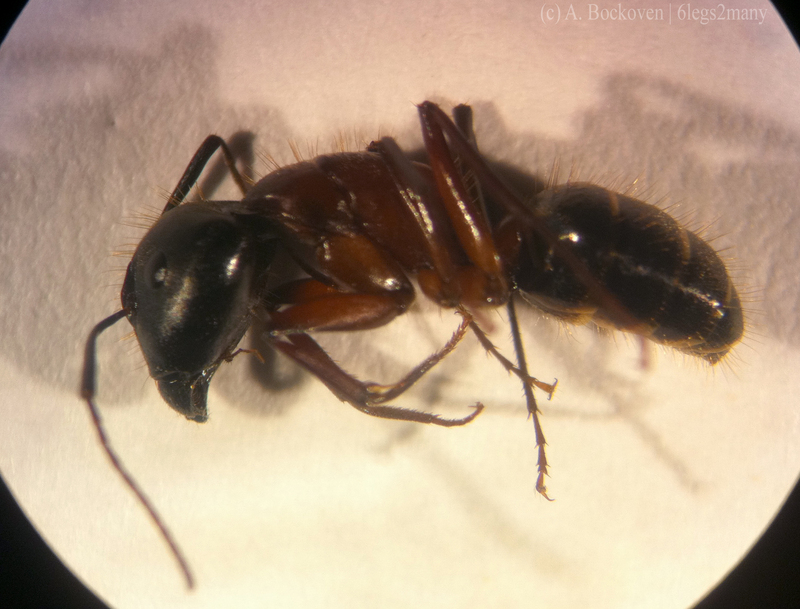 They are referred to as “callows.” Their exoskeleton darkens as it hardens, until they are prepared to go about the daily business of an adult worker ant. 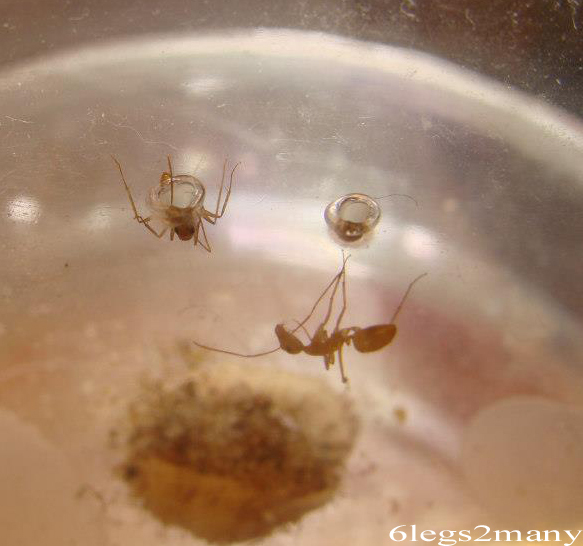 PS: Here is a cool video of a queen ant helping a pupa shed its old larval skin. 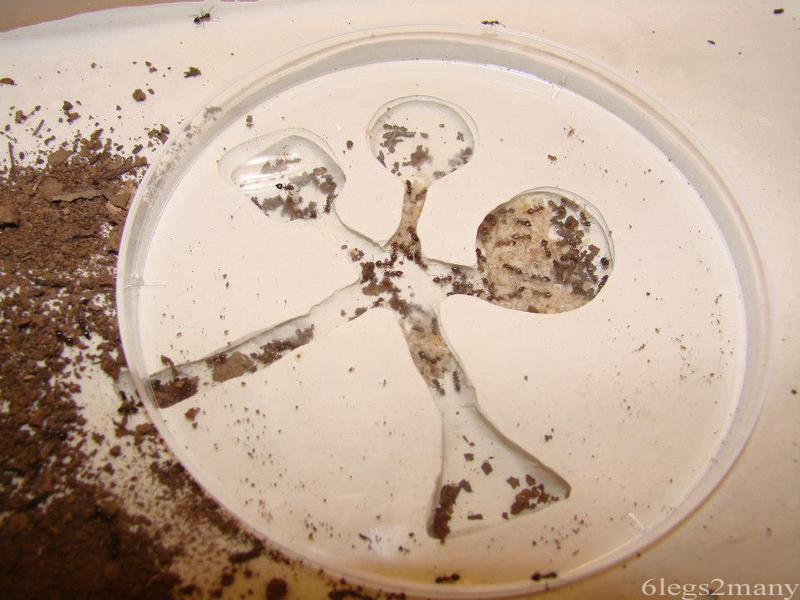 Since my “Ant Farms: How to Build Your Own Formicarium” page is one of my most visited articles, I’ve created a page to compile some different ant rearing/formicaria designs that I have seen or used. Acrobat ants in a flat plaster nest. Carpenter ants checking out air holes at the top of a colony. Monomorium ants with a tube nest. Rover ants and queen with brood in plaster nest. 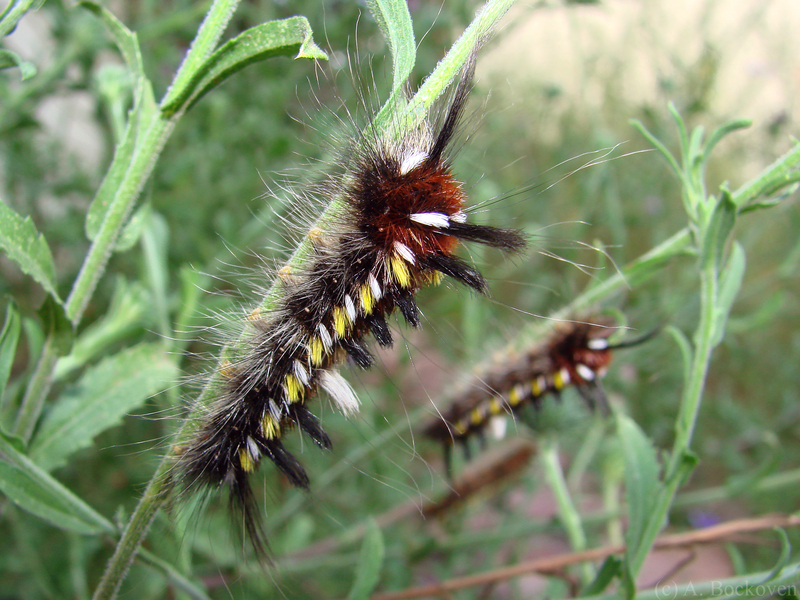 Colorful silkworm caterpillars feeding on vegetation. The moral of the story is that scientists cannot be trusted to name things in non-confusing ways. 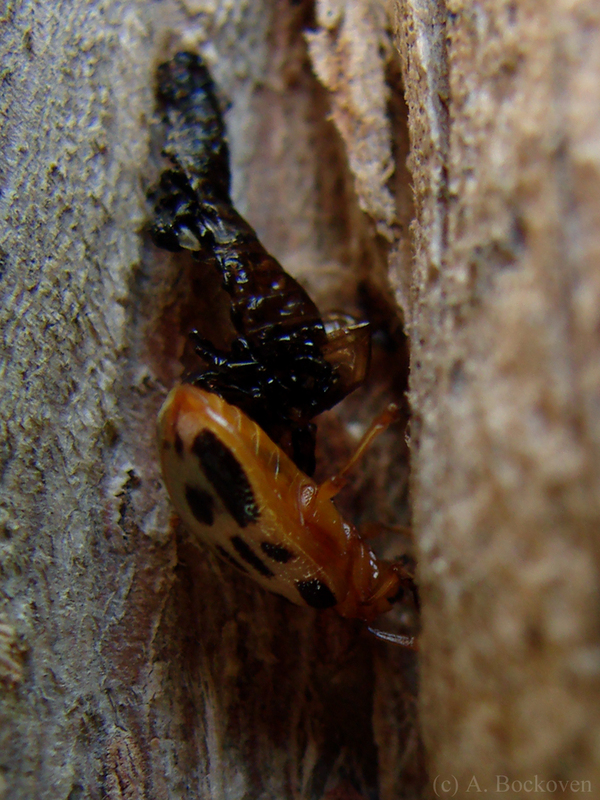 A bess beetle tends larvae in the interior of a rotting log (Photo courtesy Paul Lenhart). A few weeks back I did a post on bess beetles, and their fascinating social structure. These beetles live together in family groups, communicate via an elaborate vocabulary of squeaks, and cooperatively care for the developing brood. Paul Lenhart recently snagged this awesome photo of an adult beetle with a group of larvae and was kind enough to let me share it with y’all here at 6legs. I thought I’d take the opportunity to do a bit more research and elaborate on what I learned last time. 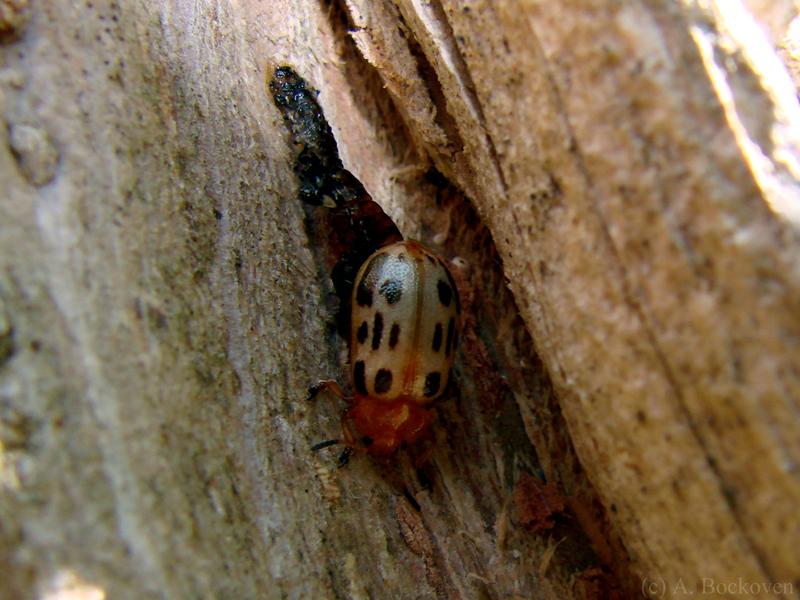 Initially, a male or female beetle finds a rotting log, and begins hollowing out a tunnel. Later the beetle will accept a mate, following an elaborate courtship ritual complete with specific acoustical signals. The mated pair then cooperates on the tunnel and defends it fiercely from intruders. A clutch of about 30 eggs is laid in a nest of finely ground wood in the tunnel. When the eggs hatch into larvae, the parents cooperate to feed them specially prepared food–specifically wood which has been pre-chewed, passed as feces, and partially digested by microorganisms. 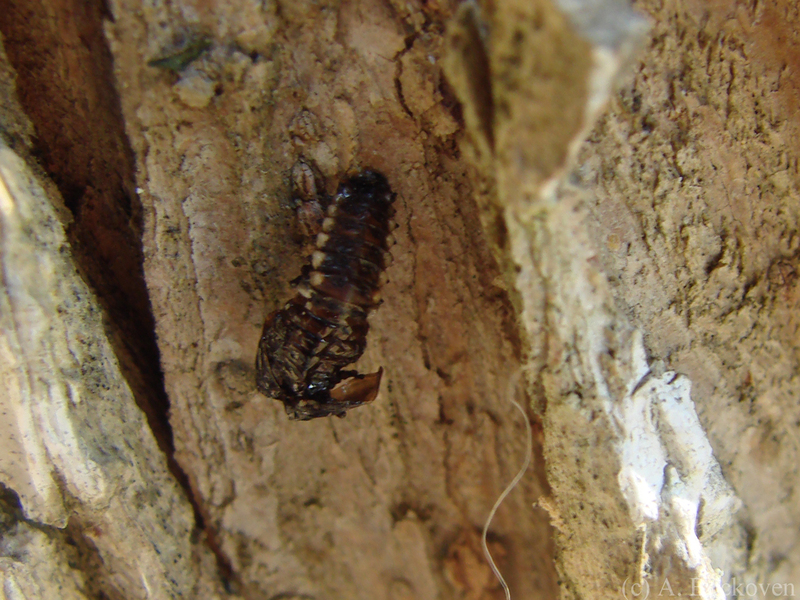 When the larvae pupate, the adult beetles construct protective pupal cases around them out of wood debris and feces. Interestingly, young adult beetles cooperate with the parents to help care for their siblings. 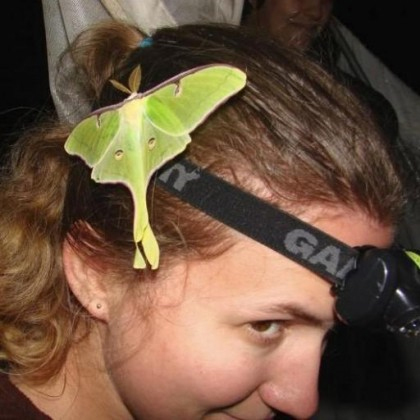 The mated pair can have several clutches of eggs over the course of a year, and will often court and mate again in the nest when the initial brood has pupated. Newly eclosed young adults require several weeks or even months for their adult exoskeletons to fully harden and darken to black. 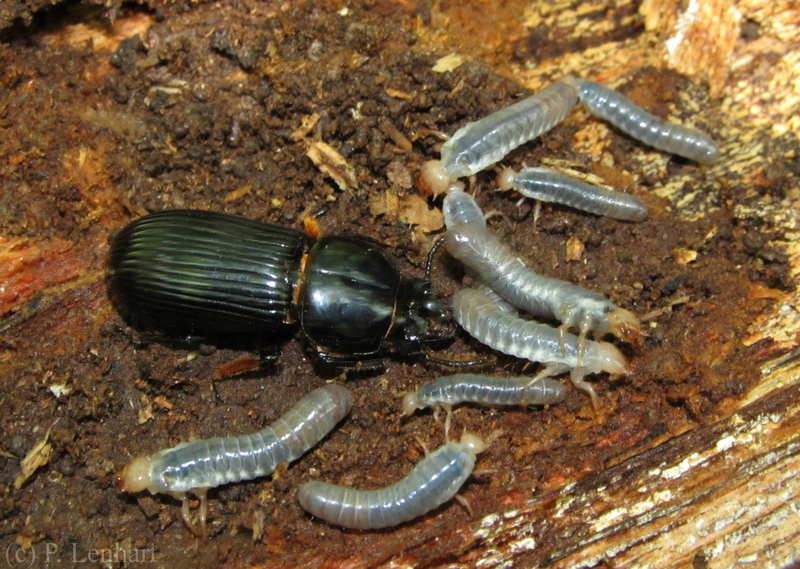 These young adults are called “teneral” or “red” beetles, and remain in the tunnel, feeding larvae, helping to construct pupal cases, and defending against intruders. Evidence suggests they may sometimes remain even after reaching full adulthood, assisting their parents and siblings. Eventually, these beetles migrate from the log to join a mate and start their own family. Bee fly with eyes eaten out by dermestids. 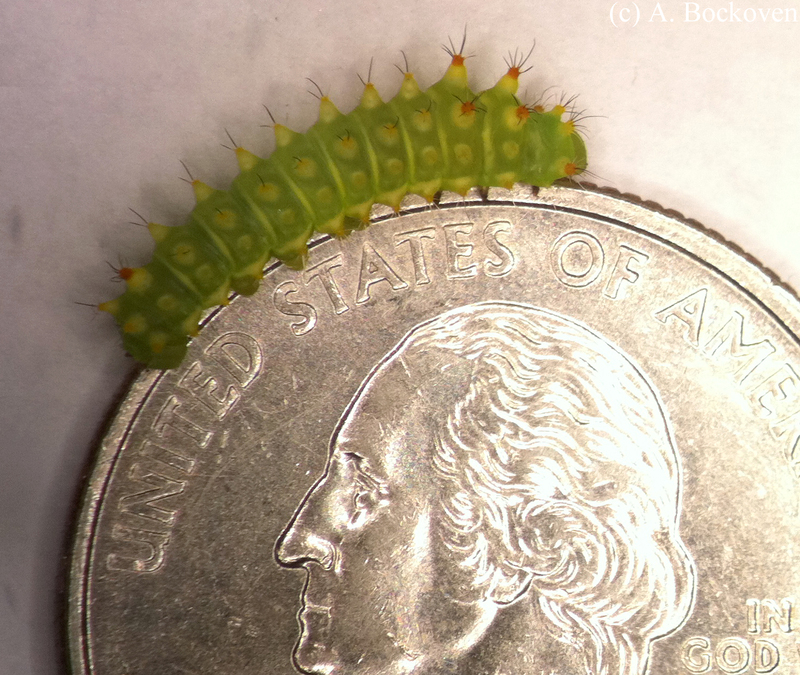 Here’s a sight no insect collector wants to encounter in the collection boxes. 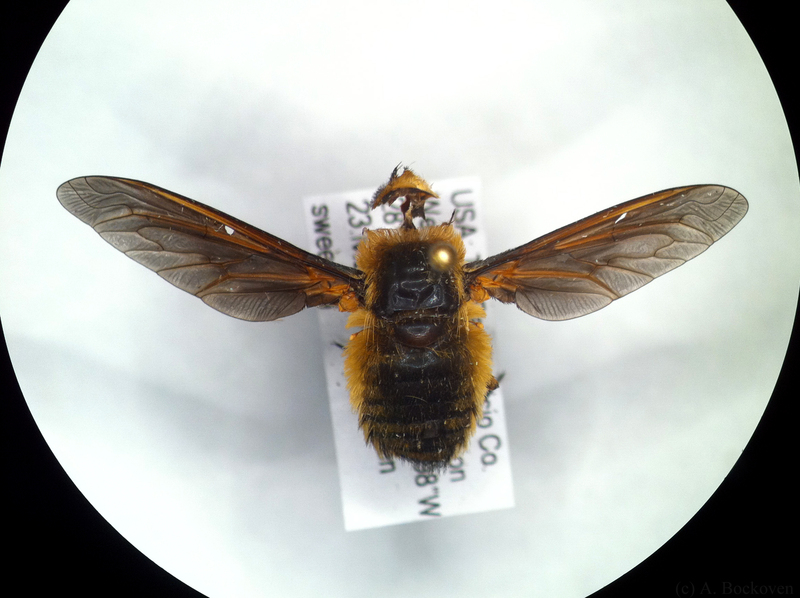 I was sorting a mixed box of pinned specimens when I found that this fuzzy bee-mimicking fly had met a second untimely fate (the first being the fate that led him to be pinned in my collection). As you can see, the large bulbous eyes that occupy most of the bee fly’s head are, um, no longer occupying. In fact, they’ve been rather neatly eaten away. Apparently, bee fly eyes are delicious. Dermestid damage in an insect collection. With mounting horror I sifted through the collection box and found all the signs: tattered insects, scattered frass, and (the smoking gun) cast off larval skins. 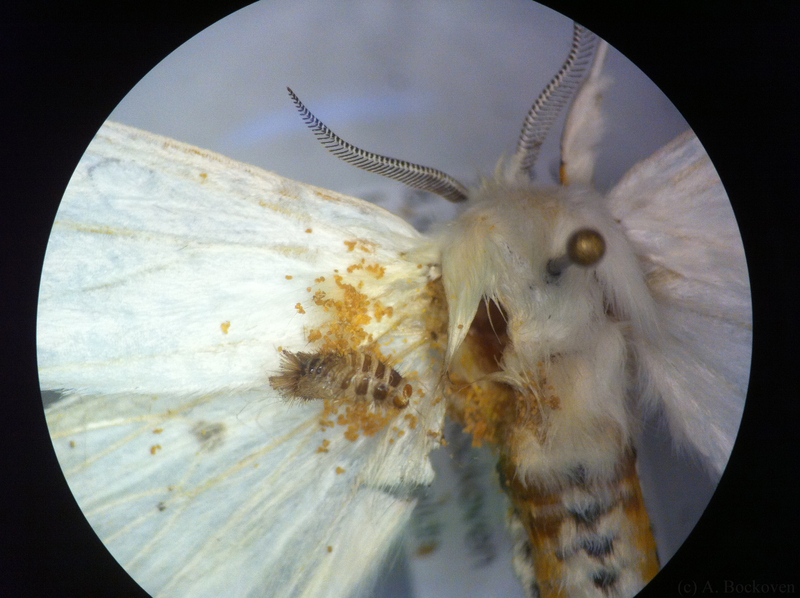 One hairy skin stuck to the wing of a tiger moth whose hollowed out abdomen had apparently made a tasty treat. 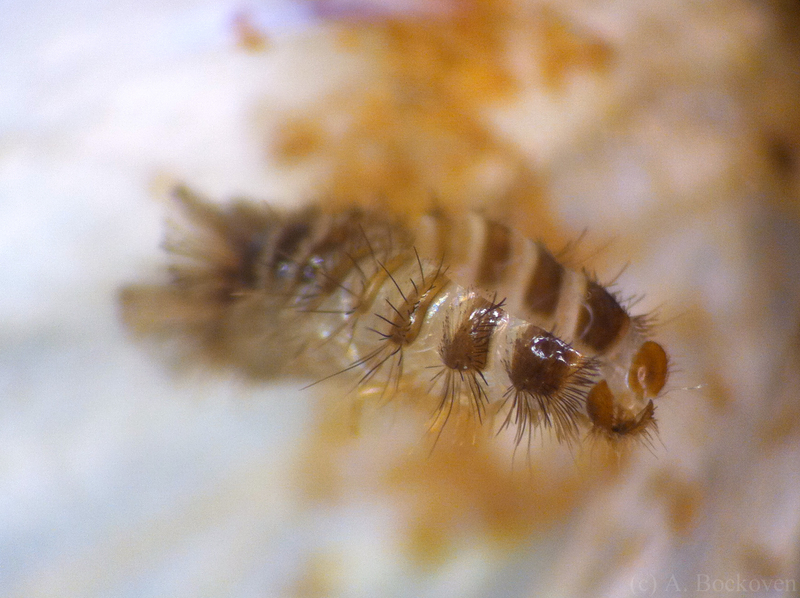 Cast off exoskeleton of a carpet beetle larva (Dermestidae). Dermestids. Oh, joy. 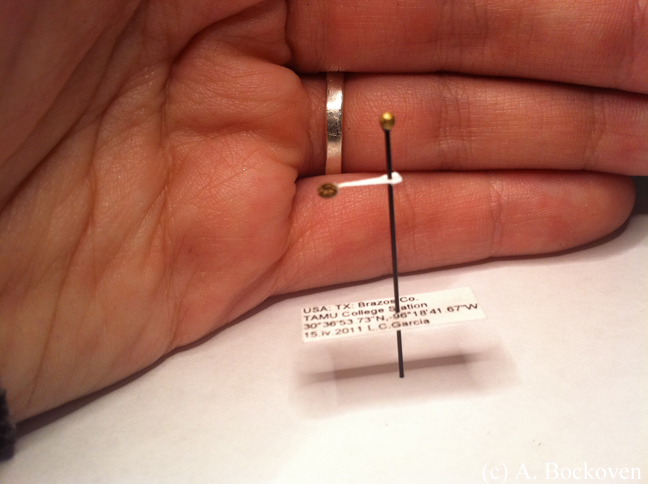 Is there any insect that is more unwelcome in an insect collection? (Actually, my friend Paul had an unpleasant experience with a voracious colony of fire ants, but that’s another story.) These guys, often called carpet beetles or hide beetles, are dietary specialists on dry, high-protein organic materials. Everything from dandruff to leather to natural fiber carpeting may become their food source. 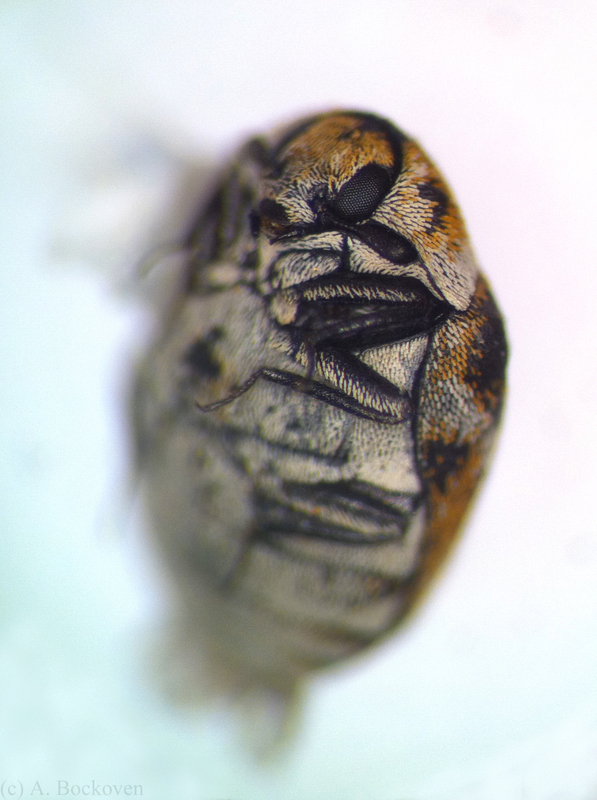 Carpet beetle close up (80 times magnification). 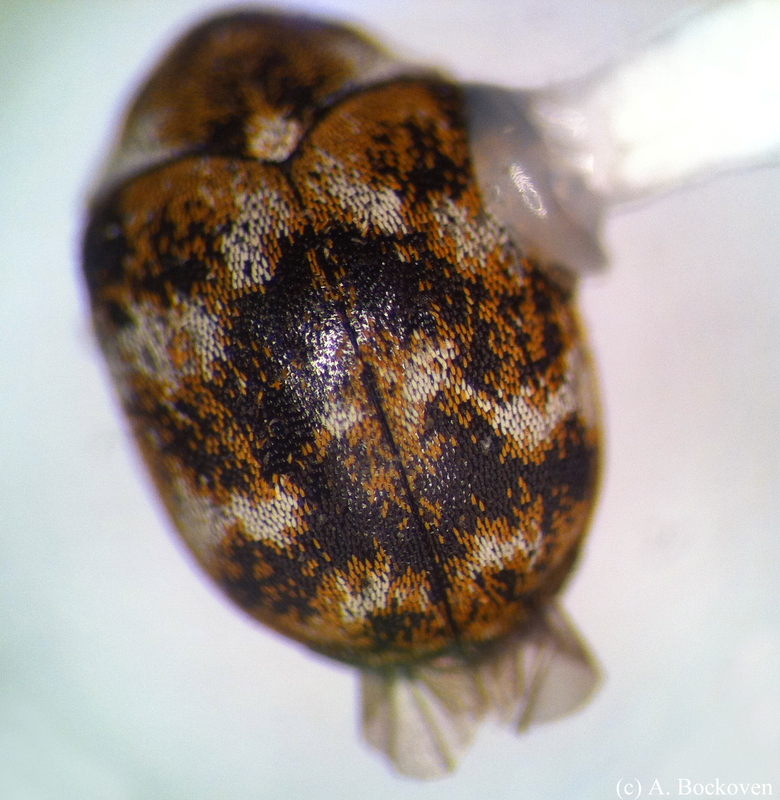 The scaled exoskeleton of a varied carpet beetle (Anthrenus verbasci). These particular guys were varied carpet beetles, a fairly common indoor pest. Examining them under a scope reveals that these tiny, nondescript little blobs are quite striking. The beetles are covered with tiny, multi-colored scales in orange and white and black and their rotund little bodies, with legs retracting into grooves, mak them look something like carnival balloons. Pretty adorable for something that can leave a trail of carnage and destruction in its wake. The legs of the carpet beetle can tuck back into grooves. Luckily, the damage was fairly limited (the two specimens pictured here were by far the worst off) so I can consider the whole incident with amusement and interest. The pictures were fun. The collection? Is cycling through the freezer. Only dead bugs welcome in these boxes. Can we talk for a minute about the fact that I took all these pictures with my cell phone? Forget hoverboards; we are living in the future. Right now. 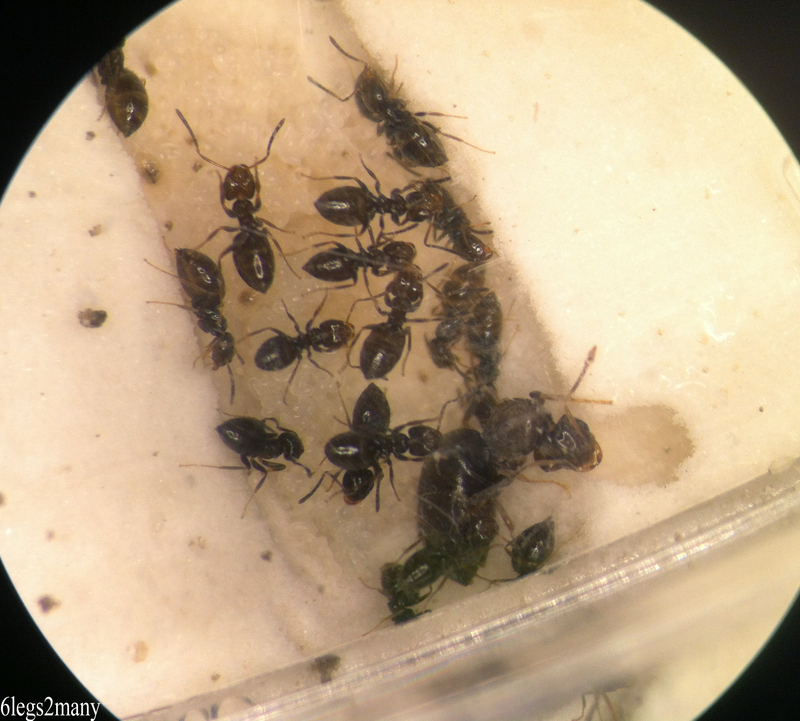 It would never have occurred to me to point an iPhone down a dissecting scope without Alex Wild’s recent post over at Myrmecos. Clearly, I had tons of fun with this. I highly recommend it. 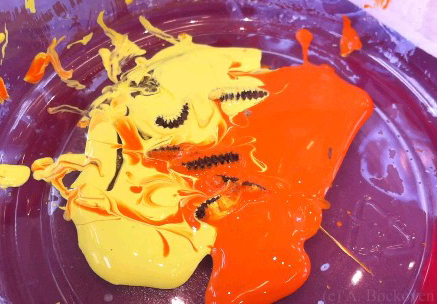 Here’s a video I put together of the “maggot art” I talked about earlier this week. Enjoy! Two new pages up today in the Techniques section. 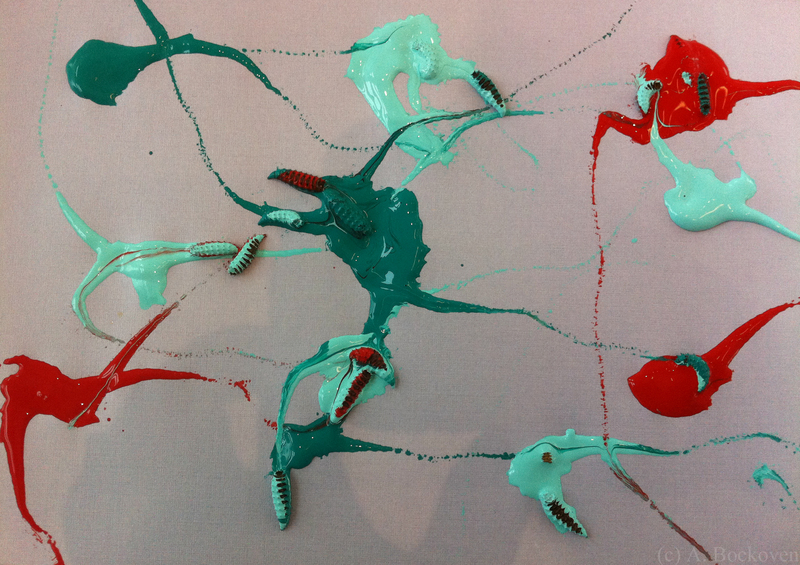 Maggot art makes a nice item to sell or give away at events, and it also provides a fun, hands-on outreach opportunity that people of all ages can enjoy. 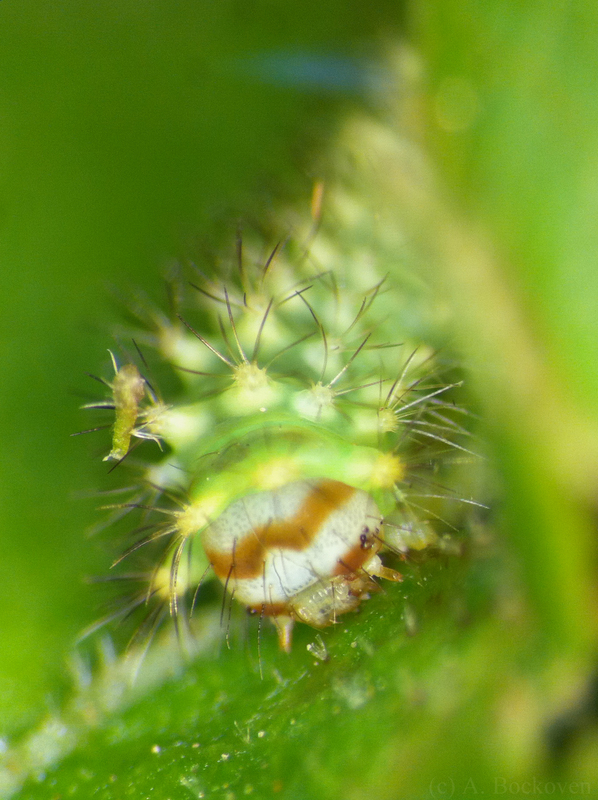 It’s great to watch people go from “Ew!” to “Ooh!” as they see a disfavored insect make something pretty and interesting. Don’t forget to talk to people about the role of maggots in the ecosystem, the life cycle of flies, and the usefulness of maggots in cleaning wounds. The maggot artwork also makes for a nice souvenir to take home, and hopefully encourage people to talk about what they learned with even more people. A red-headed Chrysomela leaf beetle (Chrysomela texana). These red-headed Chrysomela leaf beetles were all over the park near my home this week, mostly in the vicinity of a large willow tree, the beetles’ food of choice. 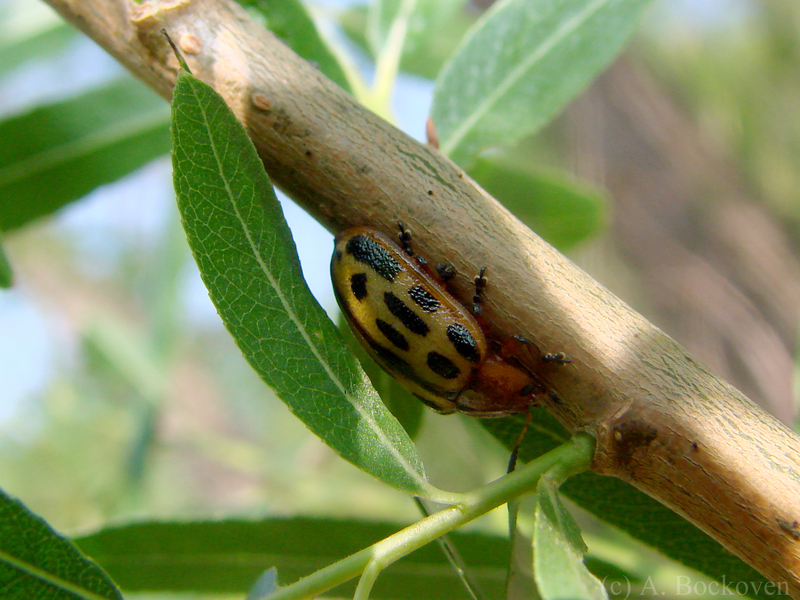 Chrysomela texana are close relatives of the cottonwood leaf beetle (Chrysomela scripta). C. texana can be easily distinguished by it’s red pronotum, head, and underside (most similar species have distinct black markings on these areas). Every life stage of the beetle was apparent, from the yellow eggs laid in clusters on a leaf, to the lady beetle-like black and brown larvae, skeletonizing the surrounding vegetation in gregarious clusters, the red-brown pupae. 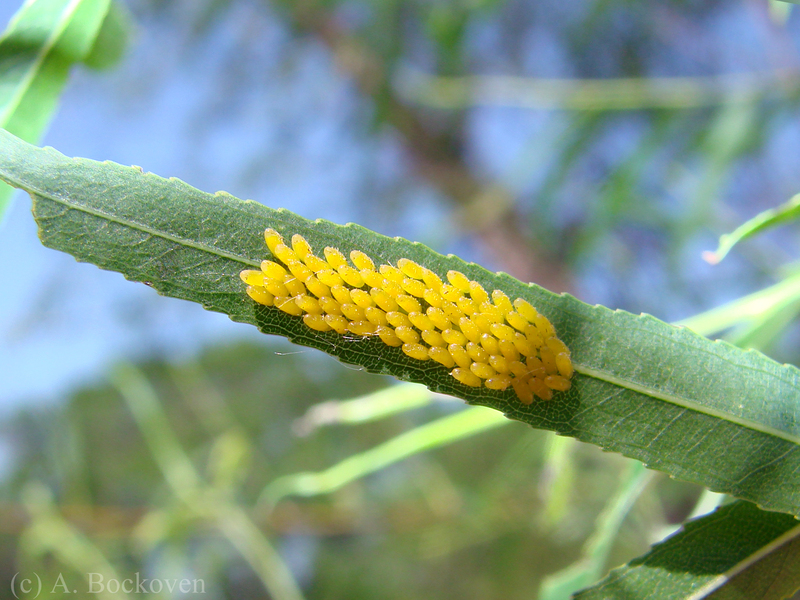 A cluster of yellow red-headed Chrysomela leaf beetle eggs on the underside of a leaf. 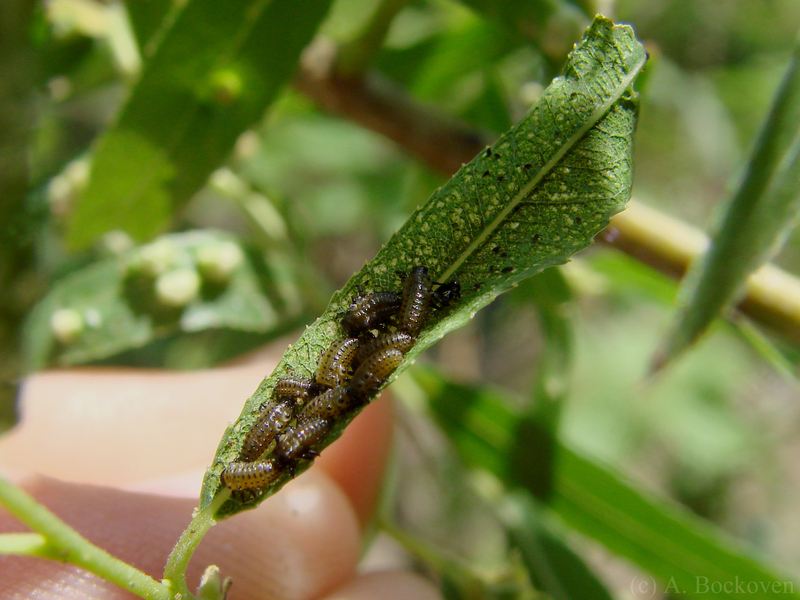 A gregarious cluster of red-headed Chrysomela leaf beetle larvae skeletonize a willow leaf. 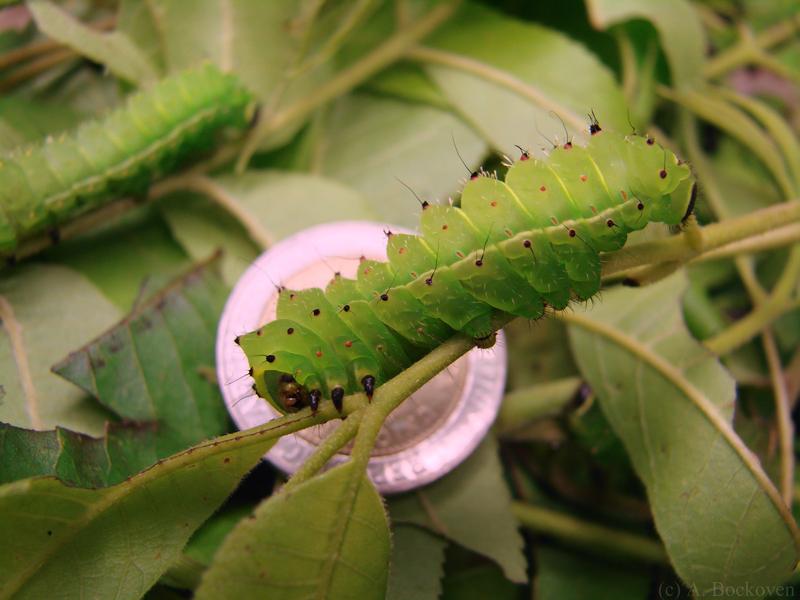 Like swallowtail caterpillars, the larvae have cool, eversible glands which they use to secrete defensive chemicals (as pictured by Mike Quinn on BugGuide). The pupae of these beetles were particularly abundant. They seemed to be stuck to every surface I looked at–tucked under bark, into crevices, dangling from leaves and even from small flowers and weeds. This gave me the chance to snap the pictures below of a beetle struggling out of its pupal case. I even took a few home, but they were sneaky and eclosed on me when I wasn’t looking. A red-headed Chrysomela leaf beetle (Chrysomela texana) ecloses from its pupal case. A red-headed Chrysomela leaf-beetle ecloses from its pupal case. 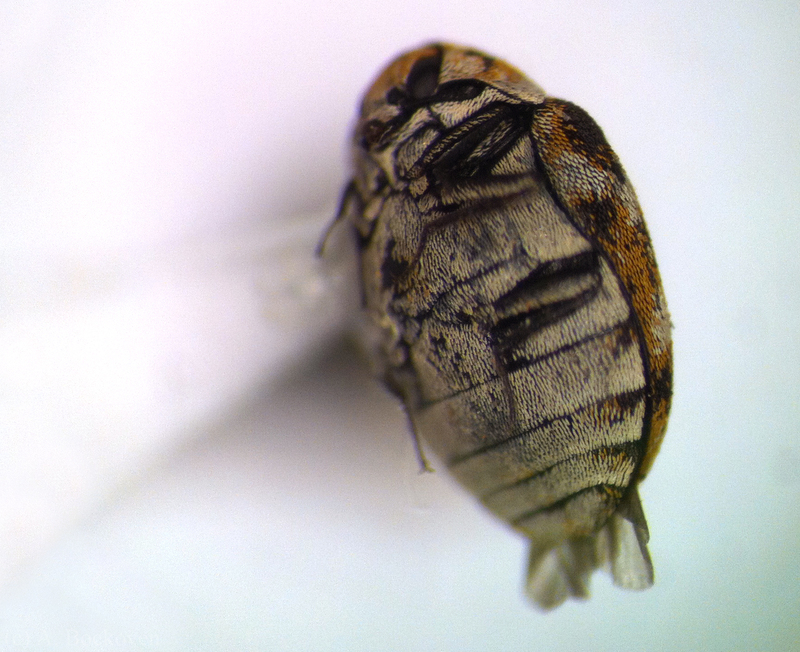 Cast off pupal case of a red-headed Chrysomela leaf beetle. 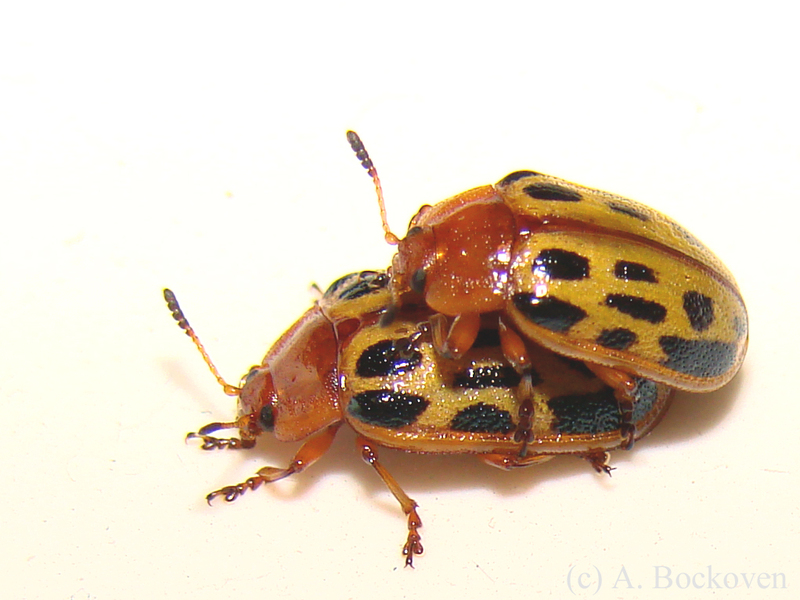 A mating pair of red-headed Chrysomela leaf beetles (Chrysomela texana).